Bows, railguns and hover tanks are yours to command. Final Stand, the December 2014 DLC for Battlefield 4, is free to download this week on Origin. The pack requires the base game to function, of course, and the offer expires on May 24. Final Stand adds four maps— Operation Whiteout, Hammerhead, Giants of Karelia and Hangar 21—set in some icy parts of Russia. The pack's futuristic theme is provided by the addition of a hover tank and a rail gun, while the Phantom bow fulfills the 2013 requirement that all action videogames feature a bow because bows are great. Other gadgets, such as the experimental XD-1 Accipiter, hint at a series move back to 2142 that never materialised. Battlefield 1 will move to WW1 this October, so this is your chance to sample a modern BF game with a futuristic tone. 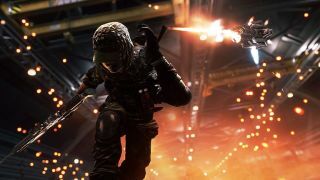 The Battlfield site says that we can expect more free handouts for Battlefield 4 and Battlefield Hardline in the months leading up to Battlefield 1. We'll let you know when they drop.